My friends Eduardo and Walter are in town from New Zealand They’ve been on the road for six weeks (London, Moscow, St. Petersburg, Valencia, Cappadocia and Crete) and want some R&R in Tel Aviv. Only, apparently, one of them doesn’t because less than 48 hours after arriving Eduardo has decided he wants to hit the road and visit the lost city of Petra, in neighbouring Jordan. Eduardo realises that there’s no point in further discussion with his beloved. But he’s not ready to give up and so turns his head in my direction. “Come with me. I’ll pay for everything. It will be an a real adventure.” He rolls his eyes at me, like the true Latino he is, but he doesn’t need to - I’m already convinced that it’s a great idea (being a gal that loves any kind of adventure). The next morning we’re on the long road south to Eilat by 7am. We’ve decided to cross into Jordan from Israel’s southern border (named “Yitzach Rabin") then take a taxi to Aqaba ) which is on the Red Sea, then take a public bus to Wadi Musa, the desert town in which Petra is located. Neither of us is a fan of organised tours…we want to travel at our own pace, not be herded on and off buses and told when to eat breakfast. Moreover, the tours on offer are pretty pricey and we think we can do it cheaper. But these aren’t the real reasons of course - the truth is we’re in search of adventure! After an uneventful bus ride journey (just under 5 hours), rather than take a cab, we jump on a public bus in Eilat and alight 10 mins walk from the border At the Israeli side it’s very simple - we pay our departure tax (106 shekels each) and hand over our passports for stamping. 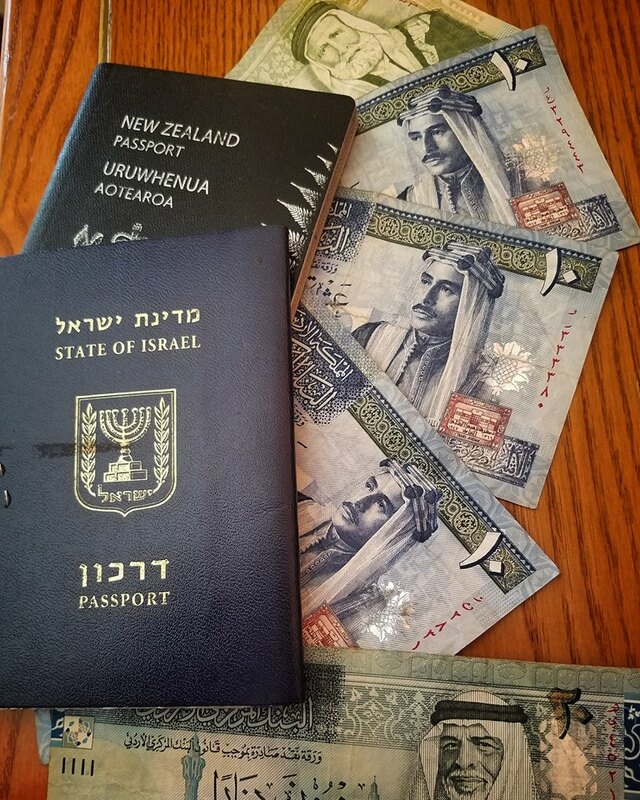 We walk across “No Man’s Land” (a couple of hundred metres) in the direction of Jordanian “Arrivals” and once there, because I’m travelling on an Israeli passport but Eduardo a New Zealand one, we head to different counters. And here is where it gets interesting. My friend is stamped in, immediately. I, on the other hand, am asked where I’m heading. Not knowing the problems telling the truth will result in, I answer honestly. “Guide tax? Sorry, what’s that?” I ask, rather surprised. “But my friend doesn’t have to pay it. So why do I? I am pretty annoyed, not to mention taken aback. I am well aware that Jordan changed their visa requirements two years ago (upping charges enormously) but, as I understood it, these applied to everyone and were levied according to how many nights you stayed in Jordan (i.e. that the longer you stay, the lower the tax is). But this you pay only when you leave the country and we’ve just arrived! Besides, they’re talking about a “Guide” tax. I look at Eduardo, who rolls his eyes (having been born in Mexico, he knows a ruse when he comes across one. We both understand this is about a ‘bribe’ or, in Spanish, ‘la mordida’). “But each day, over 1,300 Jordanians cross this border to Israel, to work in hotels in Eilat. Is Israel charging them a “Guide” tax?” (This, of course, is a rhetorical question - I know the answer full well). The border guard scowls at me then turns to Eduardo. ”Welcome to Jordan” I think, wryly. In other circumstances, this would make me laugh for not only is Eduardo not my husband, he has his own husband! But since this is Jordan, where homosexuality is a crime, I hold my tongue. I dream about what it would be like to slap him but then give myself a reality check. His superior then appears, having been watching this spirited discussion from a distance. “This is the law” he sighs. I’m half minded simply to return to Eilat, and not spend a dime in a country that wants to take my money purely on the basis of my nationality. If I were alone, I’d be out of here pronto but I’m not alone and I know Eduardo has been dying to visit Petra for years. So, putting aside my own grievances and with my friend’s happiness in mind, he and I troop back to my country where we spend a good hour, phoning around trying to get advice on how I go about paying this tax. I call agent after agent in Eilat, who are all bad-tempered (this, of course, is not the first time any of them have have heard this story). No-one can help me and some are not particularly polite in imparting this fact to me either! I finally get hold of a woman who knows the ropes. She informs me I’ll have to pay §50 US - for this, paperwork can be brought to the Jordanian side for the “Guide” tax. This will take another 45 minutes. We sit and wait. Finally we are summoned back to Jordanian arrivals where I spy a young guy. Apparently he’s just arrived from our destination (Aqaba) and in his hand he holds two sheets of paper. He hands them both to the official, and takes one back, stamped. Then he holds out his hand to Eduardo who presents him with a crisp $50 bill. .
Now I understand everything, We’ve just forked out $50 for a “Guide” who isn’t even going to drive us to our bus station, let alone “guide me” to Petra. That’s a nice little earner for him and the Jordanian government. And there’s not a damned thing I can do about it either. “How often do you do this?” I ask him. “Regularly” he replies, matter of factly. Then he jumps into his car, and speeds away, leaving us at the mercy of a bunch of aggressive taxi drivers, all ready to charge us through the nose for a 10-minute ride to Aqaba. "Cheap Alternative to Bus, ma'am?"